Can your kids solve this challenging dinosaur maze? This little maze is a real challenge that’s perfect for elementary schoolers. It’s sure to keep them focused and quiet on a weekend afternoon, giving you a moment to finally relax. 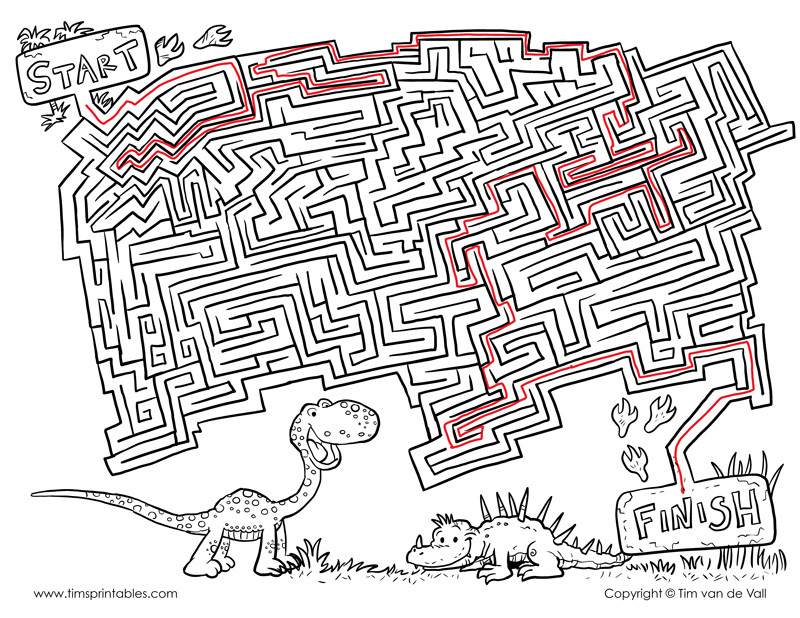 Once your kids have completed the maze, let them color the two cartoon dinosaurs. The one on the left is a brachiosaurus. The one on the right, I don’t know what that is, some sort of spikey fictional dinosaur I decided to draw. You can view the answer key here. Note: There may be more than one way to solve the maze. If you’d like to print more mazes, take a look at my shark maze, my treasure hunt maze, and my space ship maze. The brachiosaurus was a long necked giraffe-like sauropod dinosaur. The term brachiosaurus was coin in 1903 by paleontologist Elmer S. Riggs, who discovered brachiosaurus fossils in Colorado. Scientists believe brachiosauruses were warm-blooded herbivores. They lived about 150 million years ago during the Jurassic Period. Brachiosaurs was approximately 26 meters in length (85 feet) and weighed between 35 and 60 tons. This enormous sauropod may have been between 9 and 13 meters (30 ft to 43 ft) tall. If your kids have completed the dinosaur maze, but want another maze activity, please visit the Maze Section of Tim’s Printables! For more awesome dinosaur printables, stomp on over to the Dinosaur Section. Highlights include: A T.Rex Color by Number Activity, a Plesiosaurus Coloring Page, and collection of Dinosaur Cut Outs, great for your little paleontologists.